The reasons why Larochette is called Little Switzerland are easy to see from the tranquil forests, pastures and tinkling brooks that fill the landscape. Magnificent and unusual rock formations add a dramatic touch, while centuries-old castles supply a heavy dose of romance. To enjoy the very best of luxury camping here, let LUX-camp book your comfortable mobile home at a holiday camping site that allows you to take full advantage of this spectacular setting. A landscape that begs exploration. Guided tours to discover the full beauty and history of the region. A campsite that provides comfort, serenity and lots of fun and activity. 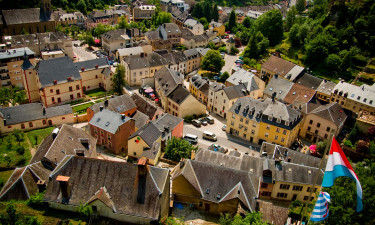 Extended fun and entertainment at nearby Luxembourg and surrounding villages. A luxury camping site in Larochette will place guests amid the myths, legends and history of a region that is one of nature’s finest works. 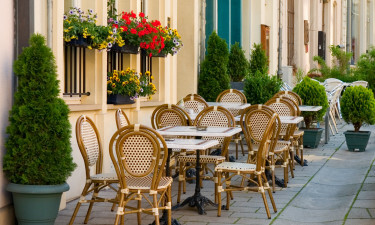 Larochette is an interesting mix of medieval city with its castles and manor house and a modern town of shops, restaurants and hotels. Renting a mobile home via LUX-camp at a luxury camping site here will ensure a camping holiday filled with new experiences. The Birkelt luxury camping site is perfect for relaxing into nature and letting it soothe away everyday tensions. Once recovered, guests can enjoy a futuristic pool complex, a variety of sporting facilities, an exciting kiddies play area, horse riding, and an invitingly warm bar and restaurant. 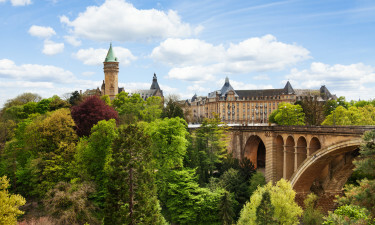 With meadows, woodlands and rivers in abundance, hiking or cycling trails offer spectacular opportunities to explore the sights and sounds of Luxembourg. The 112 km of the Mullerthal trail offers 3 routes by which to view the Larochette and Luxembourg highlights. While one route concentrates on the spectacular landscape, another emphasises the amazing rock formations, and a third takes visitors past the valleys, streams and age-old castles. This castle dating from the 11th century still stands guard high above Larochette. The first standard-bearers to the House of Luxembourg are thought to have occupied the castle towards the end of the 12th century, but toward the late 14th century it became home to 5 separate aristocratic families. Maboge Beach provides the sand and surf necessary to camping luxury, while Luxembourg’s many nature parks offer magnificent opportunities to get close to the region’s fauna and flora. Luxury camping is made possible by a warm and temperate Larochette climate, which can include significant rainfall. Smoked pork is a favourite dish in this region, and traditionally served with boiled vegetables, beans and potatoes in gigantic portions. Veal schnitzel with various cream sauces is another traditional favourite, while white wines and beer most often satisfy the thirst.